Rotary Head in 360 degrees freely, can realize perfect stitch in all sewing area. Equipped with 7 inch color LCD screen, standard slots of CF Card and USB Port. By using USB DISC Card reader, the input and output of data various memories (FD,SM, CF and SD) can be realized easily. Sewing head part of the machine can be increased up to 6mm, dealing with all kinds of thick and soft materials, with code scanner function. Equipped with thread broken detector. If bottom thread finished during sewing, machine will stop automatically. And flash a warning signal on the screen to notify the operator. 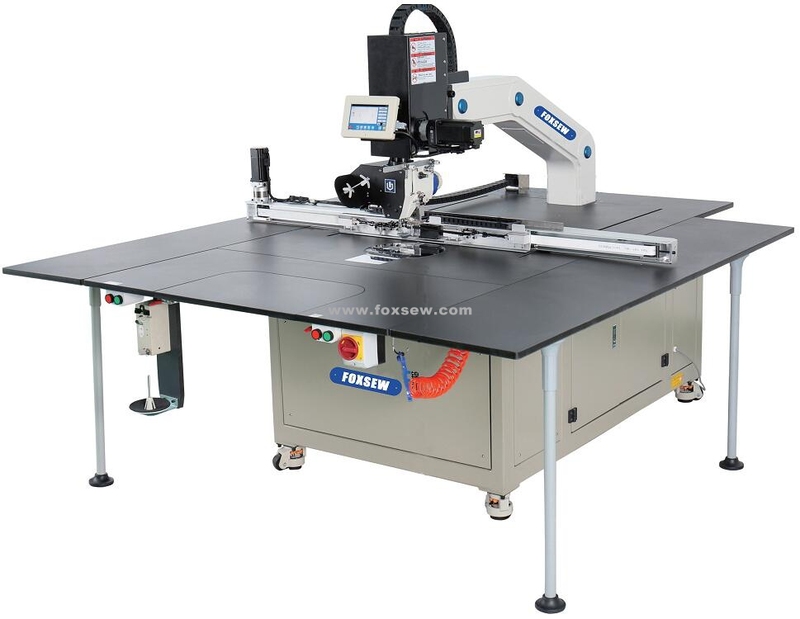 Maximum sewing area up to 1200mmx900mm, Others sewing area are available for customized accordinlgy, like 1200mmx800mm 1200mmx600mm, 1000mmx800mm, 1000mmx600mm, 600mmx600mm, etc...Quick clamp changing system. Accurate motion control of the head and bed, the errors of the rotation according to the independent rotation of head and bed are minimized by controlling the rotation angel of 0.05 degress. The stable sewing quality is realized by moving presser foot up and down with fine-turning a press of using the motor. Adopts double size hook and automatic hook lubrication, work producticity has increased by minimizing frequent bobbin changes cycles when sewing large patterns. Consumers convenience and machine durability is increased with automatic hook lubrication. FOXSEW Pattern Sewing Machine for Applications: Leather Sofa, Leather and fabric Upholstery, Car seats, Aero Seats, Boots, Shoes, Shoes Uppers, Footwear, Handbags, Furniture, Car upholstery, Saddles, Luggage, Suitcase, Backpacks, Leather Jackets, Leisure wears, Sportswear, Down clothes, Warm clothes, Jeans, Sofa, and attaching label, widely used for many different industries. Used for: Apparel, Automotive and Aircraft, Leather Goods and Shoes, Military Uniforms, Safety Equipment, Industrial Equipment, Medical, Embroidery and Decorative Stitching, Home Furnishings. Pocket attaching, Attaching Labels, Badges, Applique work, Velcro and Decorative stitch, Any operation which requires frequent stopping and changing the angle of stitching. Advantages of pattern sewing machine: No skill required, Saves time and labor`s cost, Uniform stitching of a particular part in all pieces, Cost effective, Increases productivity.